It is also being done to obviate the scope of misuse of the OPRS system. VIJAYAWADA: In a move to come out of the red, Andhra Pradesh State Road Transport Corporation (APSRTC) is planning to set up petrol filling stations at 18 locations across the State over the next few months, vice chairman and MD NV Surendra Babu said. “Earlier, the Corporation had leased out its own lands to oil companies to set up petrol filling stations and royalty was paid to APSRTC. But now, we have decided to operate the filling stations on our own by deploying contract and outsourcing staff. Tenders will be invited shortly from the oil firms and the least quoting firm will be given the task,” Babu said while briefing media persons on Wednesday. An APSRTC team, after conducted a feasibility study across AP, identified 18 locations for setting up the petrol filling stations. Initially, the petrol filling station at Kadapa will be commissioned in next few months, he added. The locations include Nuzvid, Rajole, Rangampet, Eluru, Tenali, Jammalamadugu, Atmakur (Nellore), Mydukur, Kadapa, Rajampet, Anaparthi, Kavali, Venkatagiri, Madanapalle, Pileru, Proddatur, Adoni and Kurnool. Babu said the Corporation is operating around 3,300 special services between October 10 to 21 from Hyderabad to ensure hassle-free journey for passengers visiting various destinations during Navaratri. 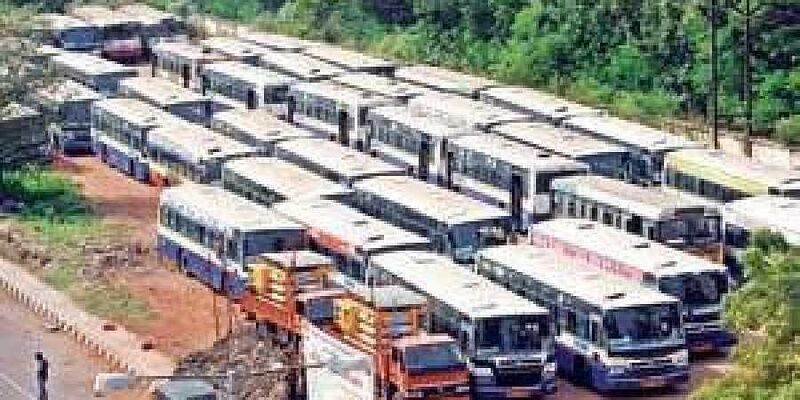 For the first time, the Regional Transport Corporation will operate 1,500 bus services from Hyderabad on October 16 as the passenger influx would be doubled ahead of Vijaya Dasami (October 18), he said. Justifying collecting 50 per cent extra fare for the special services as the demand would hit a low after Dasara celebrations, he said online passenger reservation system (OPRS) would be introduced in a phased manner to avoid blackmarketing of bus tickets. It is also being done to obviate the scope of misuse of the OPRS system. Referring to steep hike in diesel prices, Babu said the corporation has not increased the bus fares though diesel prices rose from `48 to `75 in the last three years. Rajamahendravaram: For the first time, the APSRTC’s depot in Rajamahendravaram has topped the list of profit making depots as it made `2.76 crore by the end of September, 2018, an RTC official said. Speaking to Express, RTC’s Rajamahendravaram depot manager Peddi Raju said increased productivity, highly motivated workforce and employees’ reposed trust in the administration lead it to beat the Vijayawada depot for the top spot.